Flaxseed is the richest plant source of omega-3 fatty acids, but most people struggle with how to add it to their food. Humans have been cultivating these small brown seeds for thousands of years, and King Charlemagne passed laws requiring his subjects to consume flaxseed in the 8th century because he believed in its health benefits so much. Flaxseed is found in many products today — you’ve probably eaten it without much thought. But when you start eating it every day, you may find that you feel better and look better too. Flaxseed contains not only omega-3 fatty acids, but also lignans and fiber. These three components make flaxseed an incredibly nutritious and beneficial food that can help everything from lowering your cholesterol to boosting hair growth and improving skin moisture. We’ve narrowed the list of benefits down to a few fantastic results you can expect once you start eating flaxseed every day. Plus, we have some ideas for getting more of it in your diet. In a 2014 study, researchers found that people who consumed three tablespoons of flaxseed powder each day for three months experienced 17-percent lower total cholesterol. The LDL (“bad) cholesterol levels also reduced by almost 20 percent. The fiber in flaxseed binds to bile salts in the body and enables them to be carried out through waste. Once these bile salts are removed from the body, cholesterol gets pulled out of the blood into the liver to replace them. As a result, the cholesterol levels in the blood go down. The omega-3s in flaxseed can have an anti-inflammatory effect on the heart, which helps normalize the heartbeat. It may also aid in lowering blood pressure levels. In addition, research shows that the omega-3 fatty acids in flaxseed can prevent hardening of the arteries. Along with lowered cholesterol levels, it’s easy to see why flaxseed is fantastic for heart health. Flaxseed is high in fiber, but low in carbs, making it a safe food for most people to consume on a regular basis. Even those who have to watch their carbohydrate intake carefully can eat flaxseed with little problem. What makes flaxseed so great, though, is it has high levels of mucilage gum content, which is a fiber that forms a water-soluble gel that moves easily through the digestive system. The lubricating fat in flaxseed can also keep things moving through the intestines properly. Due to flaxseed’s unique transformation into a gel-like fiber once you eat it, you might find yourself snacking less. Flaxseed helps prevent food from emptying from the stomach too quickly, allowing for more nutrient absorption. Also, some of the fiber found in flaxseed doesn’t break down when you eat it; the body can’t consume many of the calories in it. You might notice your pants fitting a little loser after eating flaxseed for a while. Rich in alpha-linolenic acid (ALA), a polyunsaturated fatty acid, flaxseed can help improve the strength and health of your hair. You might notice shiner hair with less breakage, as well as a healthier scalp after eating flaxseed more often. Flaxseed also contains vitamin B, which helps reduce skin dryness. It can also help improve eczema and rosacea, as well as acne. Your nails will also appreciate the boost of essential fats and vitamins — they become stronger and more resistant to damage when you eat more flaxseed. Research shows that the omega-3 fatty acids in flaxseed can help inhibit the growth of tumors. Plus, flaxseed also contains lignans, polyphenols that are found in plants that have both antioxidant and estrogen properties. Lignans can protect the body against cancers, especially those forms that are sensitive to hormones, like breast cancer. Not only will you feel better when you start eating flaxseed every day, but some of the effects more cosmetic effects — like shinier hair and stronger nails — will give you a confidence boost every time you look in the mirror. What’s your favorite way to eat flaxseed? Let us know in the comments! 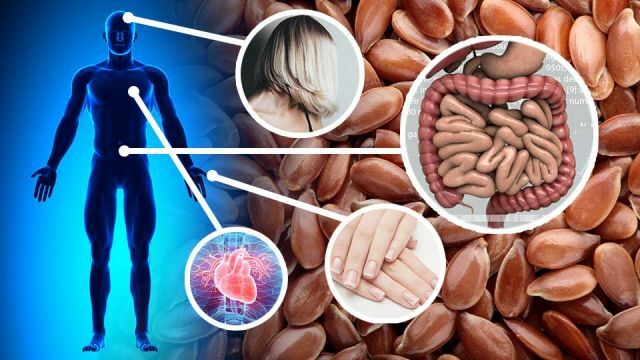 Hey Buddy!, I found this information for you: "7 Amazing Things That Happen When You Eat Flaxseed Every Day". Here is the website link: https://www.thealternativedaily.com/7-reasons-to-eat-flaxseed-every-day/. Thank you.